If you’re looking to kick-start a fitter and healthier lifestyle, there’s no better place to start than our fully equipped and air conditioned gym in Horsham. 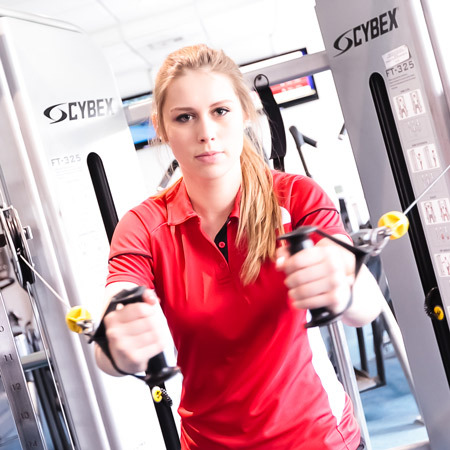 With all the very best fitness equipment including Cybex machines and a free weights area, our gym is run by a team of fully qualified, friendly Fitness Instructors who are always on hand to give guidance, advice and top fitness tips. If you’re new to The Holbrook Club, we’ll make sure you’re given a comprehensive fitness induction in our gym before we get you started on a bespoke programme. These sessions are relaxed and completely tailored to your needs and goals; you’ll be shown how to use each machine and be guided around the weights area to make sure you’re working out in the safest and most effective way possible. Every member is offered a phased programme that’s completely bespoke to your needs and objectives. Been a member for a while but not sure your programme is working? Our team will reassess your plan and help get you motivated again. Find out more about our gym membership options or call 01403 751150. For those who are regular gym users, we offer in-depth fitness testing that specifically looks at what areas of your fitness regime you need to focus on to reach your goals. If you want to find out more, speak to a member of our Fitness team who will be happy to help. In addition, our team can also offer 1-2-1 and group personal training sessions that will help you reach your goals that bit faster. We’ll teach you new exercises and keep you motivated whilst pushing your limits and striving to achieve great results. Our team of fitness experts have a wealth of experience and can also offer insightful diet and nutrition analysis to ensure every part of your lifestyle is fit and healthy. To find out more about our personal training programmes, click here.